There are some pairings that are just destined to be together: wine and cheese, chocolate and hazelnuts, and the wonderful combination of apples and cinnamon. There’s something incredibly comforting about this pairing: the tart-sweetness of the apples combined with the warmth of the cinnamon and the sweetness of the brown sugar just screams “comfort food.” And that’s what it certainly is on a cool fall/winter evening. Apples, cinnamon and brown sugar also make for an easy yet absolutely delicious dessert in the form of an apple crisp. My brother had picked up some lovely baking apples for me a few weeks back, but I hadn’t had time to do anything with them in the last little while. However, I was craving some kind of apple dessert this week. I originally had ambitious plans to make an apple pie or galette on a weeknight, but after getting home and feeling too tired from work, I quickly scrapped that plan. The alternative was a quick and easy apple crisp. 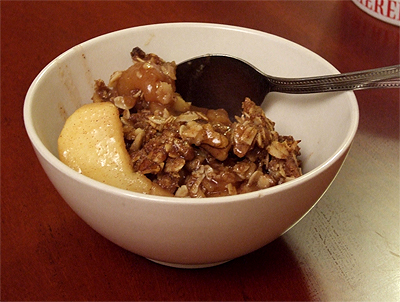 You get the satisfaction of warm baked apples without the work and less calories too (swapping the butter/shortening-laced pastry for a healthier oatmeal and nut topping)! Wonderful on its own, with a drizzle of maple syrup for some added sweetness, or with a scoop of whipped cream or vanilla ice cream! Preheat oven to 375°F. In a mixing bowl, combine apples, lemon juice, brown sugar, cinnamon, vanilla extract, and brandy. Toss to combine. Place apples into a 9-by-9-inch baking pan, ensuring that it is evenly spread out. In another bowl, combine rolled oats, flour, brown sugar, cinnamon, and nuts. Pour in the melted butter and stir until you have a crumbly mixture. Sprinkle evenly over the apples. Bake for 55 minutes to 1 hour, or until topping looks crunchy and apples are tender. Remove from oven and let rest 5 to 10 minutes. Serve with whipped cream or vanilla ice cream, if desired. 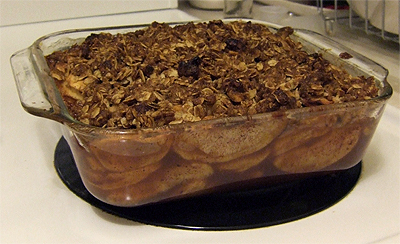 To reheat leftover apple crisp the next day, just throw in a preheated 350°F oven for 15 to 20 minutes. That’s the best way I can describe this lasagna. Why? Because it’s just about bursting out of its pan, trying to keep in all the goodness that I’ve managed to pack into it. My parents are visiting this week and my mom mentioned how she would love to have some lasagna, something she wouldn’t make on her own. And since my mom spoils me with her wonderful cooking when they visit, I thought I would return the favour. 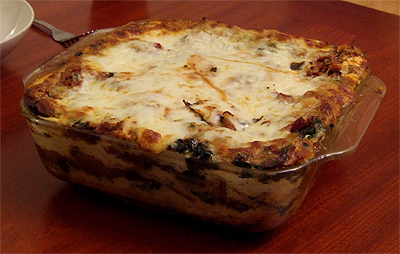 What I love about lasagna is that it is such an easy dish to prep ahead of time. I made this the night before and merely had to leave the baking instructions with my mom. I used some frozen homemade tomato sauce with Italian sausages, spices and swiss chard added to it. Sautéed some mushrooms and extra swiss chard and added them to the thawed chopped spinach. Layer pasta with ricotta, the veggies, sauce, cheese, and repeat. Bake immediately, stick in the fridge for dinner the next day, or freeze for future consumption or last minute dinner guests. Best of all, you can always count on leftovers! Preheat oven to 400°F. If your lasagna noodles requires pre-soaking in cold water, do so now. In a medium sauté pan, heat olive oil over medium heat. Add garlic and mushrooms and sauté until soft, about 5 to 8 minutes. Set aside. In a medium bowl, whisk together ricotta cheese, eggs, ¼ tsp nutmeg, ½ tsp salt and ¼ tsp pepper. Add spinach and mushrooms, and stir well to combine. Spread a small bit of tomato sauce in the bottom of an 8-by-8-inch glass baking dish. 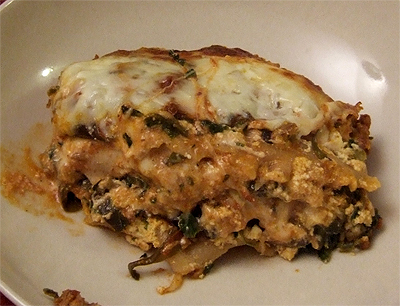 Arrange a layer of lasagna noodles on top, breaking the noodles as needed so that they fit into the dish. Spread 1/3 of the ricotta mixture over the noodles, followed by 1/3 of any other sautéed vegetables or meat you wish to add (if desired), followed by 1/3 of the remaining sauce; sprinkle with 1/3 of the grated cheese. Repeat to make two more layers, ending with cheese. If freezing, cover tightly with plastic wrap. Before baking, defrost in the refrigerator overnight. Cover with aluminum foil. Bake 30 minutes. Remove foil; continue baking until top is golden brown, about 15 to 20 minutes more. Let cool 10 minutes before serving. If lasagna has previously been frozen, be sure to remove lasagna from the fridge an hour before baking, and add 10 more minutes to the baking time. 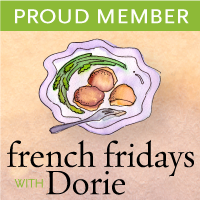 Fall is the prime time for root vegetables, and one of my favourites is parsnip. As a kid, I used to think they were merely “white carrots”, and while they aren’t exactly carrots, they are in the same family, so I wasn’t uttering complete nonsense! Parsnips also have a sweeter and more distinct flavour. It was so easy to make. Throw everything in a pot and half an hour and some blending later, you have soup! It’s light and very tasty, showcasing the natural sweetness of the parsnips. 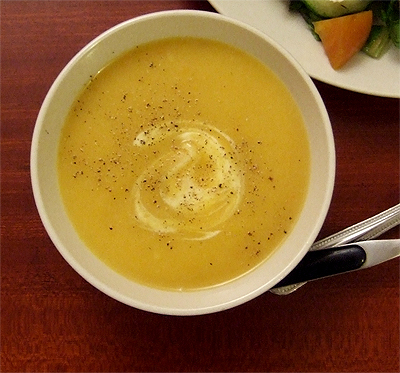 The addition of carrots helps to give the soup a beautiful yellow tint. The soup is quite thick though, so I did add quite a bit of water to reach a consistency I was happy with. Best of all, the soup freezes well, so you can make a big batch and have some on hand to serve to last-minute dinner guests! Work has been chaotic this week, and being struck down with a very severe cold that left me half delirious and a wicked cough to beat meant that the kitchen was more or less out of commission. But I’m finally feeling better, my appetite is back, and I finally made my way back into the kitchen after a huge disinfectant wipe-down of my apartment. I’ve actually had this recipe in my recipe book for over a year now, but I never got around to making it until now. 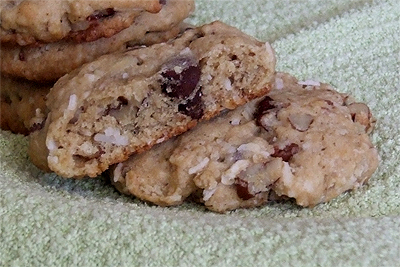 I have no clue why they’re called Cowboy Cookies, but the list of ingredients makes these cookies appealing enough, packed full of oatmeal, pecans, coconut and chocolate chips. What you get is a cookie with a lot of texture with just the right amount of sweetness in the dough and from the chocolate chips. These will surely satisfy any cookie-lover in your house! With an electric mixer on medium-high speed, cream butter and sugar until pale and fluffy, about 3 minutes. Reduce speed to medium. Add eggs, one at a time, beating well after each addition. Beat in vanilla. Using a dessert spoon, drop rounded dough onto prepared sheets, about 2 inches apart. Flatten slightly with the back of a spoon. 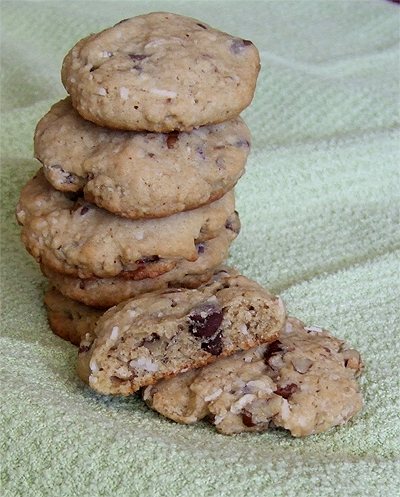 Bake, rotating sheets halfway through, until edges of cookies begin to brown, about 9 to 11 minutes. Transfer sheets to wire racks to cool 5 minutes. Transfer cookies to racks to cool completely. Cookies can be stored up to 3 days at room temperature in an airtight container.